Last nite I made pasties using leftover beef rom Sun & they were tasty. Got rutabaga & that adds flavor. Tonite I fixed chop suey so I have been more on the ball menu wise. I'm a little disappointed in the Food Channel. Guess I don't watch it enough to get the right programs. I've discovered "Barney Miller" in the aft. after my soap. I always liked that program & actors. Barb said Lynn is taking Scott to a new Dr. & thinks it's time for medication, because he can't settle down to learn. Lynn never wanted to use medication & I think Barb supported her decision. Both are now realizing something more needs to be done, for their sakes as well as Scott's. He is very hyper. Glad you're feeling better, Paul. It really had you down & out. My nose still bothers me at times but I'm not sick. I'm glad as Sun. the 28th is the annual meeting at church & I like to attend. Last year I missed it. Jan. has been better to me this year. Kim & Lar brought some wine for Christmas & Barb likes it so she has been having a glass with her dinner: Beringer's White Zinfandel. They have it at the liquor store so it's available for her to buy. I'm getting used to the new telephone. It's worth the 7.50 a month to have the caller ID. There haven't been as many calls to Dale (trying to sell him coins, etc.) since I don't have to answer. They hang up when answering service comes on. We haven't changed the message -- use the one on the phone. You can carry the phone anywhere & that is nice. Thurs. the 19th 9:50 A.M.
Marissa J. is dating a Loringer boy -- he is in 11th grade. They live in the former -- now I can't remember the name -- he was the Pres. the Forge -- home that is across the st. from church. He calls to have her come & watch a movie with him & Barb has taken her there on her way home from tending Scott. The Loringers are divorced. I'm sure Lynn has more worries now as to how well chaperoned they are. Barb just left so I'll wash the floor. Much easier now with the new mop. Very easy now. Thurs. nite Lar had some gossip for us & since you're not in Warren I'll tell you. Mr. Carey called Lar to tell him they had to take a quick trip to Susan's. Remember her husband died of a heart attack & after the baby was born Susan had some problems & the in-laws know about them. Now the in-laws want to take the child from Susan & I guess started proceedings as Susan had to get a lawyer. She moved from her home to a condo -- less work for her & she has a new man in her life. She is a good mother. Barb has watched her Sarah when they visit & the adults go out for dinner & Barb says she is a very darling child. Sure hope it works out for Susan. Her name is Sarah -- it just came to me. Sounds like you had an enjoyable weekend. Good food, good fellowship, good cards but now winter sports. Nice you can get away like that. Careys left last Thurs. for Fla. Lar checks on the house. One of their dogs had to be put to sleep due to illness. The sale sign is down but the agent can show the house if she finds an interested person. Too many houses for sale. 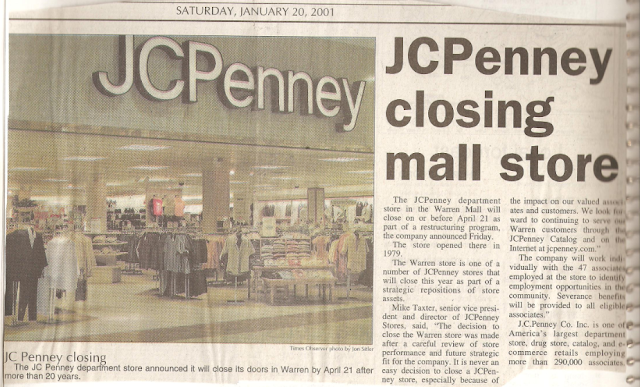 You'll notice, when the paper arrives, that Penney's is closing at our mall. They toy store went out so there isn't much at that end of the mall. We can always to go the Lakewood Mall, but I'll miss it. Didn't see much of interest in the Spring Summer catalog. It's time for the van's inspection & Dale has been going over it. He said we'll need new brakes in a few months. 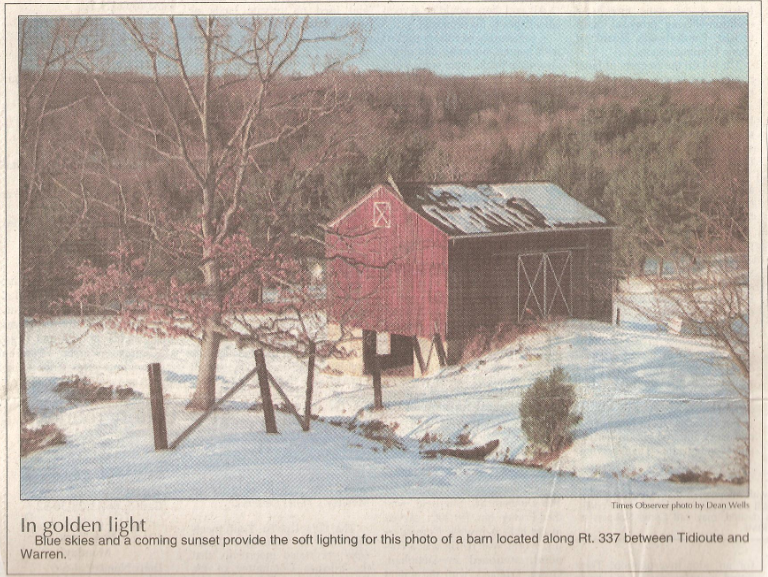 We didn't get much of the storm that hit the East Coast -- a few flurries. The aft we have sunshine & blue sky. Walking to church was cold -- temp. 21 but I dress warm. Seems strange with no football on TV. The Warren paper had an easy recipe for chicken wings. It will just be the 3 of us next Sun but I think I'll try making them & have potato salad, etc. Lar & Kim are usually with friends. Lar thinks he could build his own garage. Has some thoughts on a pole building -- whatever that is -- & thinks with Dale's help he could do it. A project for next Fall. He said Blair's near them have been cutting trees on their own property -- maybe for their fireplaces. Nothing much going on so I'll work on my puzzle. A floral design with colors so I sit & stare a lot & come up with a match now & then. I finished it. Will have another going soon. The sink is perhaps 1 of essentially the most quite important property appliances inside your kitchen along with your oven together with freezer or fridge. These three household appliances make up your kitchen area; they are, in fact, the whole kitchen countertops.